floating flattened rhombs of Smithsonite arranged in tumbling manor on matrix. crystals with a third generation of smaller crystals on there faces with accompanying crystals of Calcite. Very nice. Awesome orange spheres of Mimetite on a matrix Mimetite. I love the color of these. Color is more orange than shown. Seldom seen red crystals of Wulfenite with Vanadenite from a classic location. Crystals are more reminescent of Red Cloud material. Rootbeer crystals of Andradite Garnet on Matrix from the well known Stanley Butte mine ,Arizona. Incredible sharp pseudomorph of sparkly light blue Plumbogumite after Pyromorphite. Incredibly aesthetic specimen of free standing crystals on matrix. Copper dendrites forming a rather arborial specimen. will probably only be a hand delivered specimen. on a semi friable matrix from the world famous rowley mine. This specimen as like the one above is super fragile and will only be hand delivery. 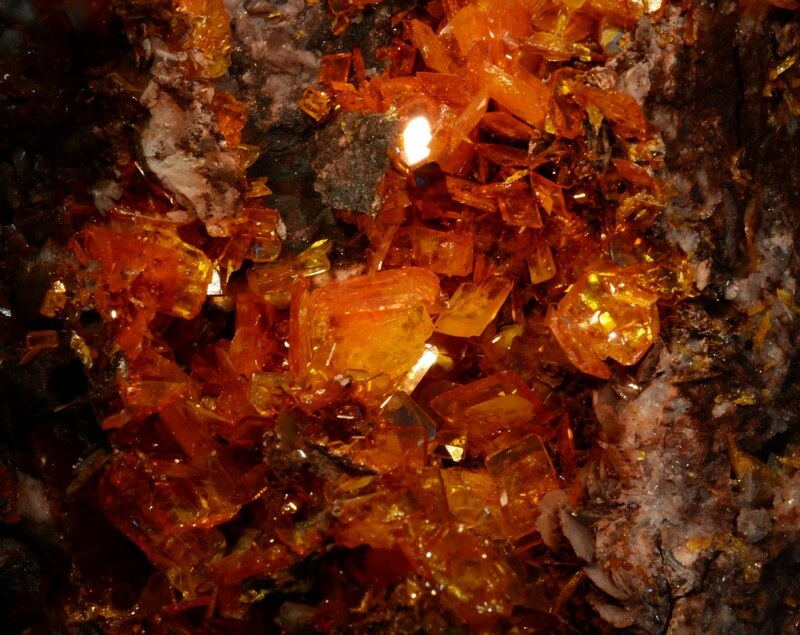 Thumber of great fire orange spheracal crystals of Mimetite. 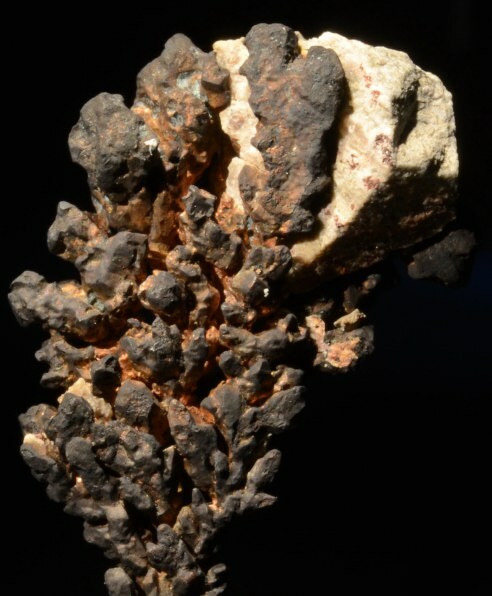 Sharp pseudomorph of copper after a large crystal of Aragonite. Ok. This is the definition of an aesthetic specimen. 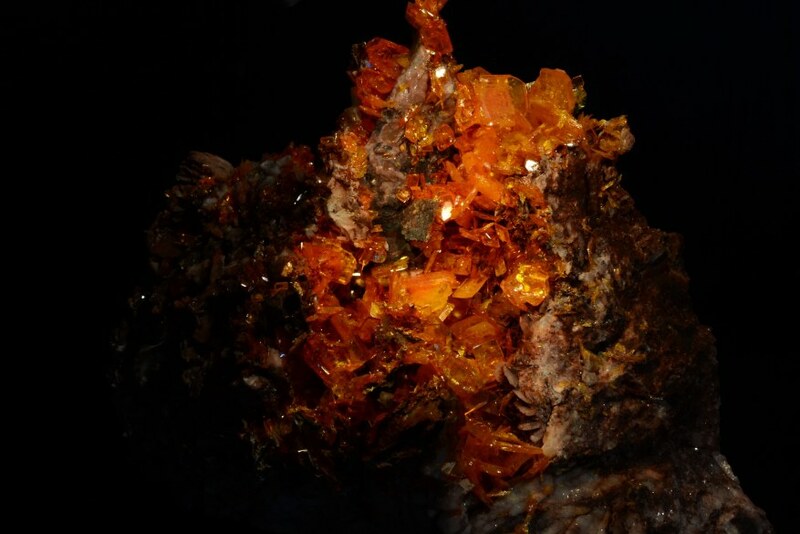 It is a very large matrix piece with a intact vug of bright orange glassy window pane's of Wulfenite. Again this is a hand delivered specimen. The sheer size and weight of it is it's own enemy. generation of white Calcite that was growing up to enclose the earlier generation. Sharp mirror luster crystals of Galena set on a matrix that gives them the appearance that there tumbling down an incline of DruzyPyrite on Chert. The crystals growing on the faces of the larger cubes give the specimen more depth. Wonderful old time specimen from the collection of Forrest Cureton and comes with his data card showing the specimen was aquired in 1956. Strange specimen of bright green Pyromorphite. 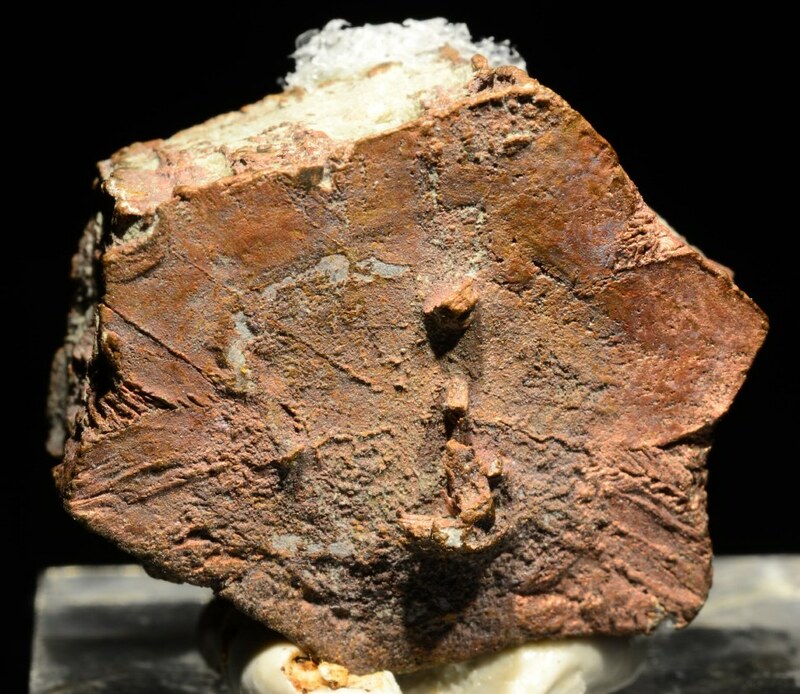 Flat parallel crystals of Pyromorphite wrap around a central point forming a "rolled" group . The specimen is hollow in the middle as you can see from the yawning mouth at the top of the . a peach colored younger generation Calcite on matrix. There are a lot of Rosasites out there on the web. Most are crusts with missing edges of damage. This is a perfect thick rounded mass of beautiful teal Rosasite. Bright yellow translucent lustrous crystals of Fluorite on matrix. 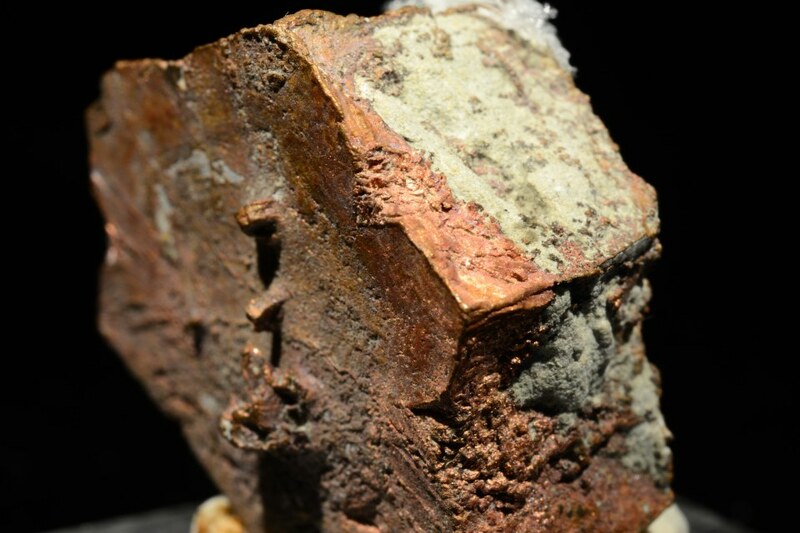 Fantastic arboreal copper on a blocky copper matrix. The crystals come off the matrix like a moonscape or trunks of old gnarled trees. Wow! The color on this specimen just pops! 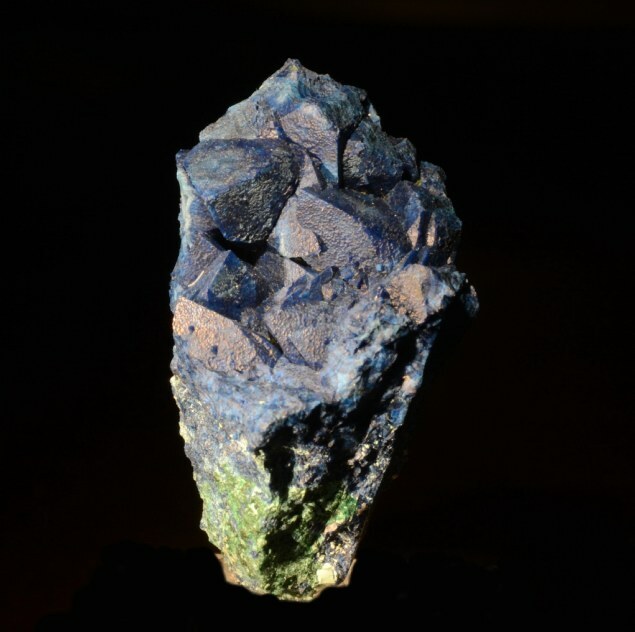 Electric blue Azurite is host to equally bright green Malachite. Surely this will be one of the brightest specimens in your cabinet! 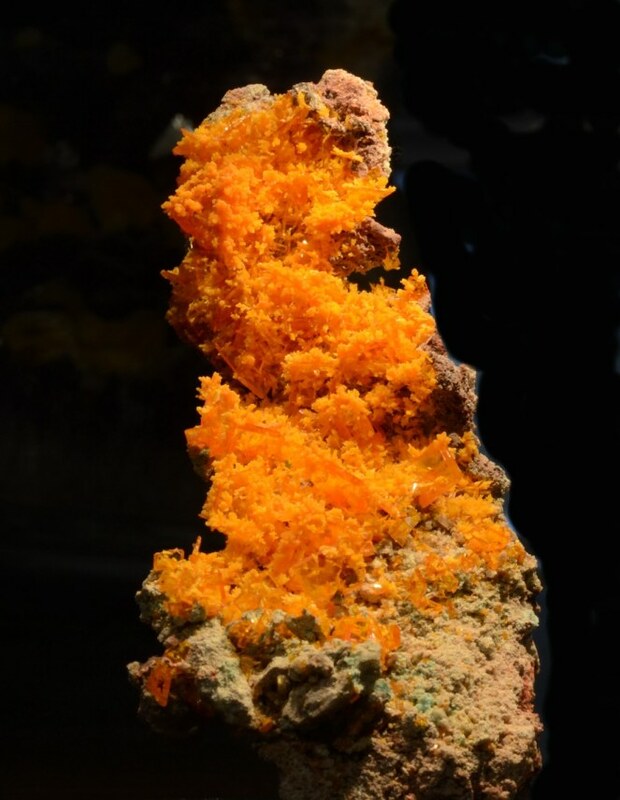 Bubbly botryoidal yellow smithsonite on matrix. The chatoyant of this specimen is fantastic! 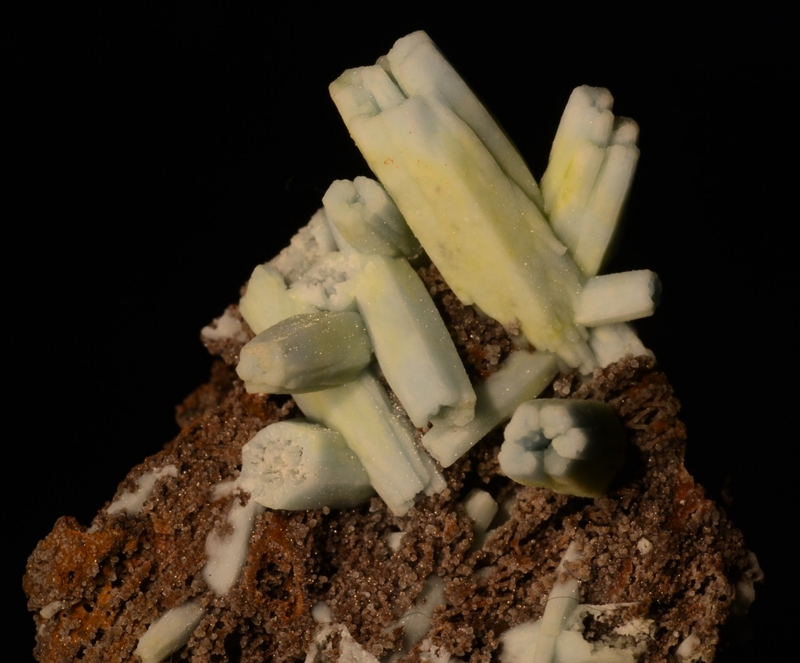 Please feel free to check the web for a finer specimen of Arkansas Smithsonite. I assure you will not find one. Red micro cubic crystals of Siderite on Calcite reminiscent of the Calcite's from Fitzington. Wonderful dogtooth mound with "pop". Neat specimen of two fat tabular crystals of Azurite on a matrix of Malachite. The crystals sit perfectly on the matrix. Showy specimen. Thin yellow blades of Wulfenite generously covered in light blue Hemimorphite. Blades to 2.5 cm There is one broken crystal as seen in the picture. Crystals to this size with the blue coating of Hemimorphite are quite rare from the location. I have seen others but they are usually grey. 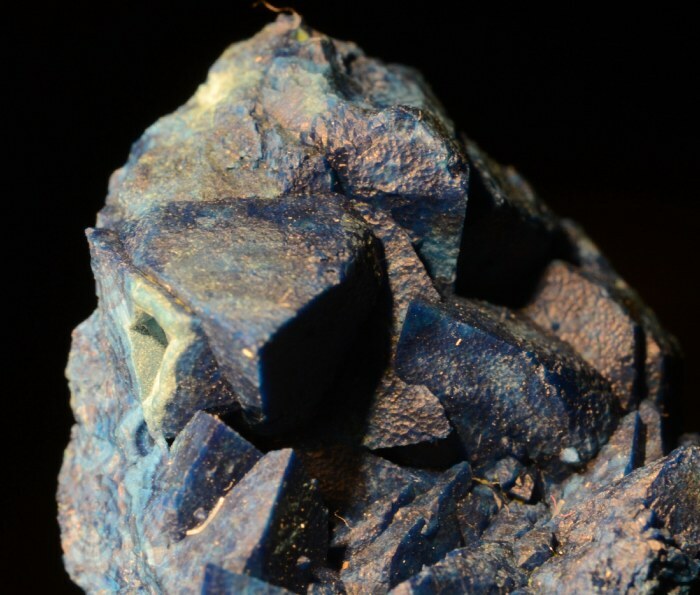 providing a home for several lustrous crystals of Azurite. One of the Azurite crystals is altering to Malachite. The crystals are hollow but don't have the typical broken crystal showing the hollow interior. Some of these have been found to hold a fine grained sand of what some speculate is the remainder of the now gone Calcite. 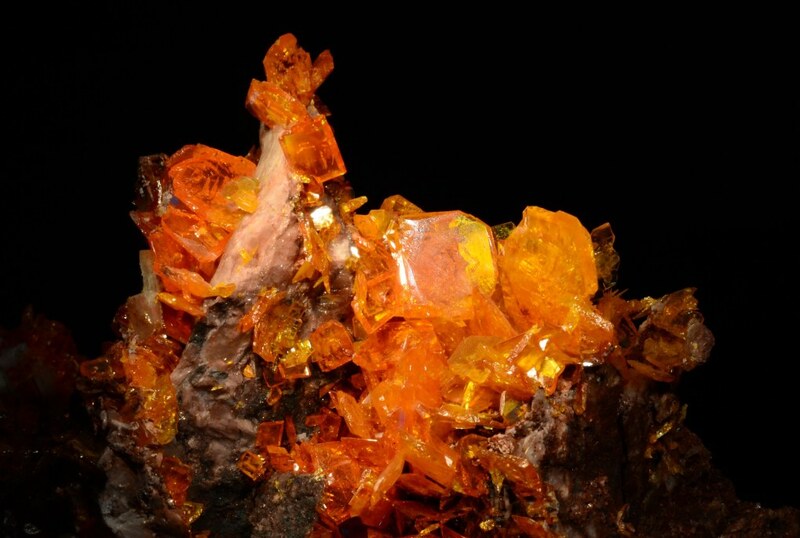 A spray of transparent to transluscent crystals of Scolicite is home to cubic crystals yellow Calcite. The backside is completely covered in the Calcites. A stunning spray on Celestite in a vug covered in thousands of smaller crystals. There are small Chalcopyrites scattered on the crystals as well. The aesthetics on this one are through the roof. Some broken crystals on the lower half but does not distract. crystals of hemimorphite. Very showy specimen!